Nossel’s article makes a number of similar points to recent pieces by David Petrasek in OpenGlobalRights (‘Another one bites the dust,’ 8 February) and myself in URG Insights (‘Is being the UN High Commissioner for Human Rights an impossible job,’ 14 February). In particular, all three articles seek to demonstrate that the precise mandate of the High Commissioner (as determined by the General Assembly through its resolution 48/141 of January 1994) includes a number of equally important though perhaps mutually incompatible elements, and it remains far from clear whether it is humanly or politically possible for one individual to fulfil them all. Acting as the secretariat to the ‘competent bodies of the UN system in the field of human rights and [making] recommendations to them,’ (OP4b of GA res. 48/141). Providing capacity building, advisory services and technical assistance, at the request of the State concerned, ‘with a view to supporting actions and programs in the field of human rights,’ (OP4d, GA res. 48/141). Engaging in human rights diplomacy (‘dialogue’) with governments and ‘enhanc[ing] international cooperation,’ in order to promote the implementation of international human rights obligations and commitments, and respect for human rights, (OP4g, OP5h, GA res. 48/141). Coordinating human rights mainstreaming across the UN system, (OP4i, GA res. 48/141). Making recommendations and driving efforts to ‘rationalize, adapt, strengthen and streamline the UN machinery in the field of human rights with a view to improving its efficiency and effectiveness,’ (OP4j, GA res. 48/141). Some parts (e.g. monitoring and speaking out) require the High Commissioner to remain aloof and independent from, and to publicly criticise, UN member States. Others (e.g. providing capacity-building support and technical assistance to States, engaging in dialogue and enhancing international cooperation, or advising States on reform of the UN human rights machinery) require a close, trustful and cooperative relationship with governments. Yet another part requires the High Commissioner to be the head of the secretariat of the Human Rights Council, its mechanisms, and the Treaty Bodies, (i.e. to be independent and impartial, and merely implement the decisions of States). Nossel’s article rightly questions whether it is possible for one person to wear all these hats at the same time. Can a single person publicly criticise States in one breath, then in the next reach out to them to forge agreement on reform of the UN human rights system or to provide human rights technical assistance? Or do the role, prerogatives, responsibilities and mandate of the High Commissioner need to be reimagined? Will the real High Commissioner please stand up? When the position of High Commissioner was created in the early 1990s, its major innovation was to enable the UN to address human rights violations wherever they occurred, without the requirement of a resolution or mandate first being agreed by a UN political (i.e. State led) body. As Nossel’s article explains, the idea was to ensure that the UN’s human rights ‘remit’ not be hemmed in by powerful member States and their propensity to cover for themselves and their allies. Even the name ‘High Commissioner’ (as opposed to, for example, ‘Director-General’) is suggestive of a post designed, principally, to allow the UN to independently monitor the state of human rights around the world, and to draw the international community’s attention to situations of violations. With this historical and political background in mind, it can clearly be argued that the core dimension of the High Commissioner’s job is, in the words of Suzanne Nossel, ‘to speak out boldly and immediately in the face of egregious human rights violations, putting the weight of the international community behind respect for universal rights and on the side of victims.’ Seen in this light, Zeid was absolutely right to focus his time and available political capital on this key part of his mandate. But what about the other parts of the High Commissioner’s mandate (as enumerated above)? Should they be simply forgotten? Clearly the answer to this question must be ‘no.’ Each and every part of the mandate is crucial to the proper functioning of the international human rights system. So how to square this circle? How can the incoming High Commissioner, Michelle Bachelet, maintain High Commissioner Zeid’s status as an independent and principled monitor of, and as the world’s ‘voice of conscience’ on, human rights; while also acting as head of the non-political secretariat of the Human Rights Council, cooperating with States to deliver human rights technical assistance, and advising States on steps to improve their domestic human rights situation or to strengthen the UN’s human rights institutions and mechanisms? The blunt but perhaps unavoidable answer is: she cannot. No one can. This in turn raises the prospect of reconceptualising and reorganising the entity headed by the High Commissioner – OHCHR. In my February article, I asked whether it is not time for the Secretary-General, the High Commissioner, States and NGOs to discuss/consider splitting the entity currently known as OHCHR between its monitoring, technical assistance/cooperation, and secretariat functions? Or, alternatively, to maintain a single entity but officially recognise that the High Commissioner’s role will be to mainly focus on global human rights monitoring and advocacy; while also creating two powerful Deputy High Commissioner positions, one that would act as the head of the secretariat of the Human Rights Council and its mechanisms, and of the Treaty Bodies, and one who would be responsible for managing UN human rights field operations and for delivering technical assistance and capacity-building support. Nossel makes similar proposals in her Foreign Policy article. For example, recognising the mutual incompatibility of the mandates to provide technical assistance to States and to publicly ‘name and shame’ States, she proposes creating a new ‘bureaucratic umbrella for the UN’s field activities, including technical assistance.’ These activities should no longer be carried out under the banner of the OHCHR, she argues, but under ‘a new entity – one named UN Rights, perhaps.’ UN human rights advisors and other human rights experts (UN civil servants) could then more easily engage and cooperate with States (in a non-politicised manner) ‘to pursue the vital work of concrete human rights training, education, and infrastructure-building.’ Perhaps the secretariat function could also fall under ‘UN Rights’ – or perhaps it should be ‘spun-off’ into another separate entity. Notwithstanding, while these new entities would still officially ‘be overseen by the High Commissioner, a separation of the [different] functions could safeguard them [all].’ It would also, in principle, further strengthen the independence and impartiality of the High Commissioner, to pursue her global monitoring and advocacy role in an even more forthright manner. For example, Nossel proposes that the High Commissioner could produce a new global ‘UN Human Rights Report,’ perhaps mirroring the UN’s Human Development Report, and might include a new ‘global human rights index’ (using human rights indicators) covering all UN member States. 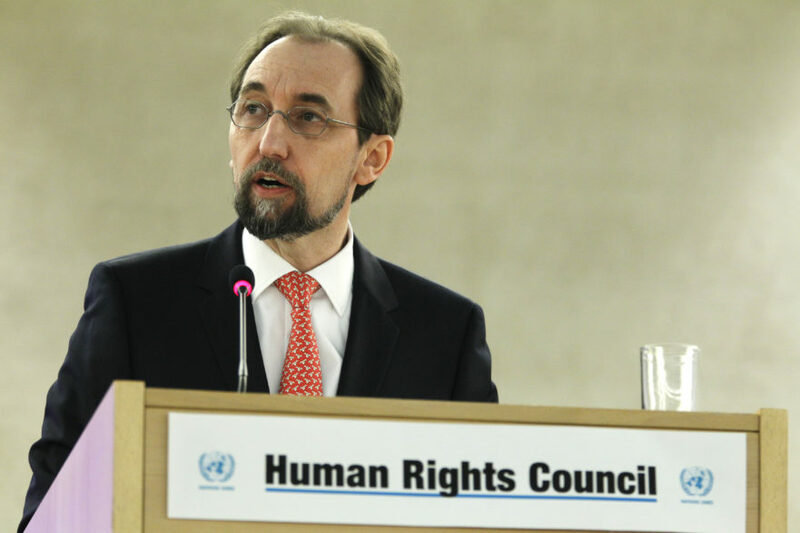 Feature photo: United Nations High Commissioner for Human Rights Mr. Zeid Ra’ad Al Hussein speaks during the thirty-first regular opening of session of the Human Rights Council, Geneva, Switzerland, February 29, 2016. UN Photo/Pierre Albouy.